LEGOs are a favorite of kids everywhere, and there are hundreds of themed LEGO sets to satisfy any child’s preference. The only downside to LEGOs is that they can be expensive. You don’t have to take out a second mortgage to buy LEGOs, though. There are multiple options for inexpensive LEGO sets at $10, $25, or $35. We have outlined our favorite 50 affordable LEGO sets so that you can give your child a great LEGO set that doesn’t break the bank. These sets are great as gifts for Christmas, birthdays, or other special occasions for either boys or girls. Cost (even within budget LEGO sets there is a range). All LEGO sets on this list are under $25, but some are around $10-$15. Age appropriate. You want a LEGO set that isn’t too easy or too hard to keep your child engaged. We have given our recommended age for each set on this list. Theme. 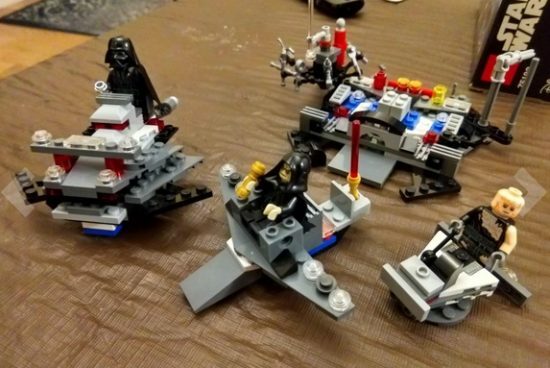 LEGO offers hundreds of different themed sets. 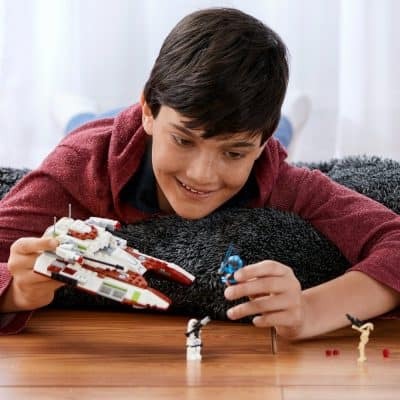 Whether it’s Star Wars, Disney, Minecraft, or superheroes, look for a themed set your child will enjoy. Complexity. The complexity of a LEGO set you purchase should depend on both the child’s age and his or her attention span. If a set is too complex, a child won’t stay engaged long enough to finish building it, let alone play with it once it’s built. Motion. 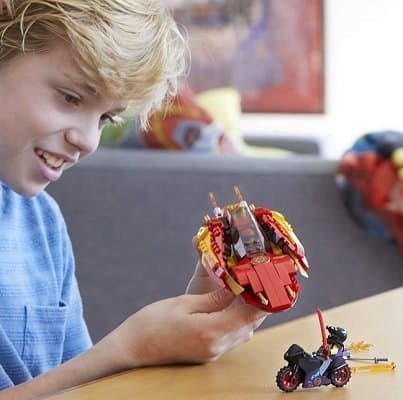 Adding motion to a LEGO set is another fun aspect for kids approximately ages 8 and older. Whether it’s a car that actually drives or a helicopter with a turning blade, kids love adding motion to their creations. 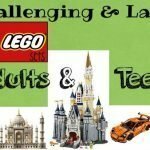 We have reviewed 10 LEGO set types and 50 LEGO sets. Click on the link below to go to the set type you would like to read about. 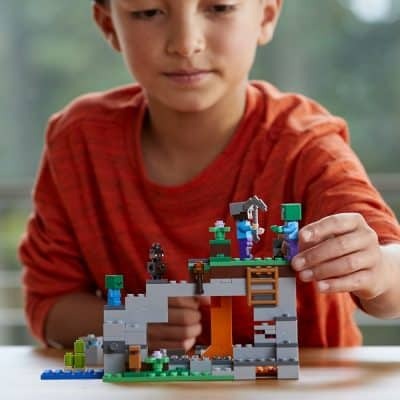 LEGO Creator Sets allow kids to combine learning with LEGO building. The best part about these Creator Sets is that they are all 3-in-1 sets. This means that there are instructions to build 3 different LEGO designs for hours of LEGO building enjoyment. 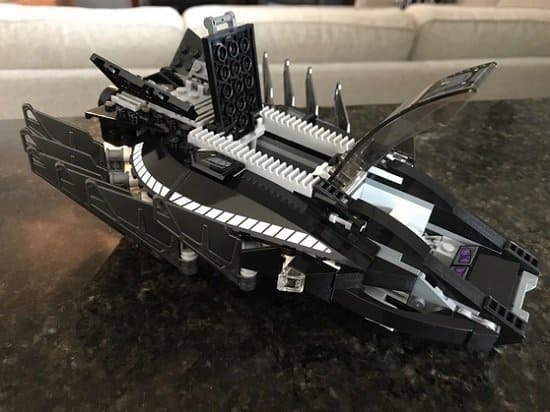 This set is one of the most popular LEGO sets out there, and it is an amazing value. At around $25, this set not only is fun to build, but it is also a great looking American icon. This great STEM LEGO set is perfect for boys and girls alike. It can be built into 3 very functional sets. All three are fun builds that will help your child imagine what it is like to be an astronaut. 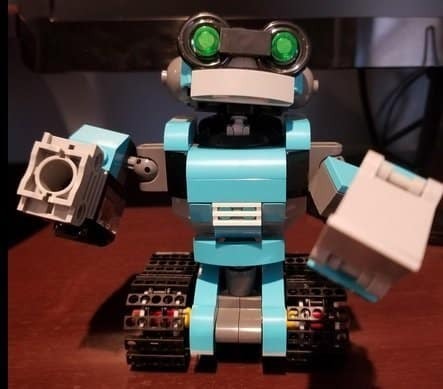 This is not only a great LEGO set, but it is a great robot toy. Your child will love the robot tracks, green robot eyes, and great robot movements. This set can be built into 3 different options, all of which will provide your child with hours of LEGO and STEM toy fun. I highly recommended this set, and it’s a great value. There are a lot of inexpensive LEGO sets but not many Creator sets that are not only fun but inexpensive. 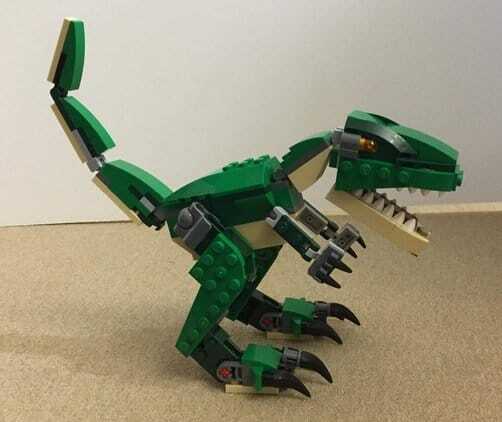 This set is extremely versatile and can be built into not one, not two, but three different great looking dinosaurs. My favorite build is the T. Rex, but the triceratops and pterodactyl are also great to build and play with. Dinosaur toys are great because they can teach and be fun to play with. For more information on dinosaurs visit the American Museum of Natural History. 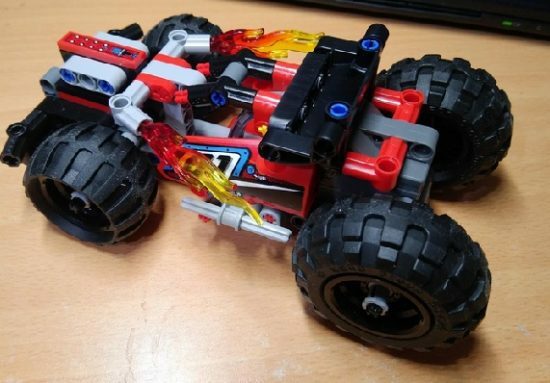 Your child will delight in building this LEGO Creator Rocket Rally Car. 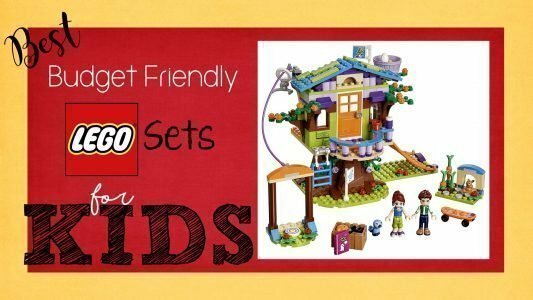 Like most of the LEGO Creator sets, this set will allow your child to build 3 distinct and different LEGO builds with instructions. The sets are all very creative in nature and feature great green, blue, and black colors. Builders of the rocket rally car build can turn to a rocket-powered turbo boost by moving the rear hood up. This set is a good value and highly recommended. 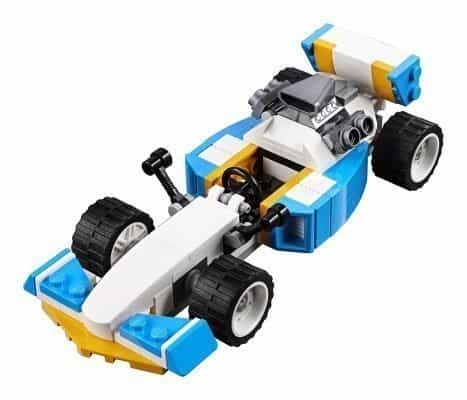 This great looking LEGO cart style, or Indy-style, race car is a fun build for a child who loves race cars or hot rods. The 3-in-1 design means that your child can have hours of building fun with one set. This set features the primary race car, a hot rod car, and a speedboat. My only complaint with this set is that it does not have a lot of pieces, and some of the finer details seem lost with the lack of pieces. I’d recommend this set for a little lower age than the rest of the Creator sets reviewed here. It would probably be enjoyed best for kids under 10. 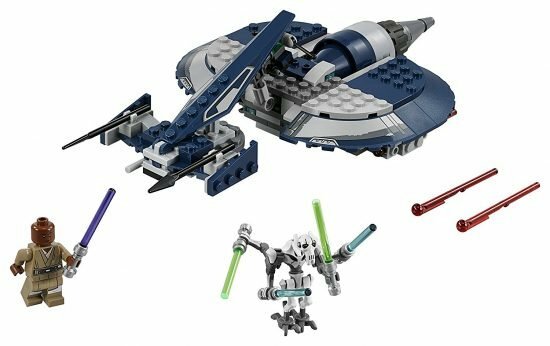 These Star Wars LEGO sets are all under $50, with many under $20. They have all the excitement of some of the larger Star Wars sets without all of the sticker shock. If you want some more complicated LEGO sets, visit our Challenging LEGO set reviews. 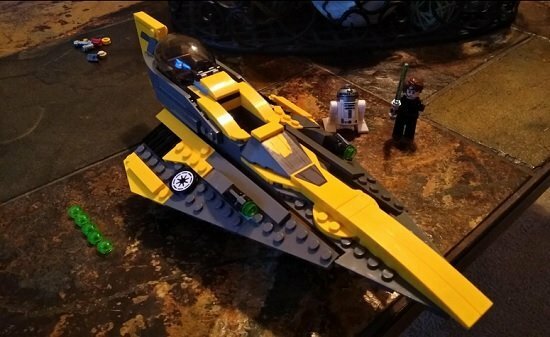 This small but great LEGO Star Wars set is loaded with a lot of value in a small package. Featuring not only Anakin but also R2-D2, this set is sure to please the young Star Wars fan in your life. The cockpit can be opened to reveal our heroes, and this set also has wings that fold open and closed. This set has some great mini figures and is a fair number of pieces for the price. This Star Wars Republic Fighter Tank set was featured in the Star Wars TV show: the Clone War. It features 3 mini-figures that allow for some great battles between the Droid Army, Clone Trooper Gunner, and Aayla Secula. The reason this set made the list was the size of the tank. Containing 305 pieces, this set is truly a great value. My favorite features on this set are the dual guns, the opening cockpit, and the hovercraft look that is given to the tank. It looks truly out of this world. Master Yoda is back in this set straight out of “The Empire Strikes Back”. You too can help teach Luke how to use the force on the planet of Dagobah. I can almost smell the meal Yoda is cooking in the back with included pots and pans. 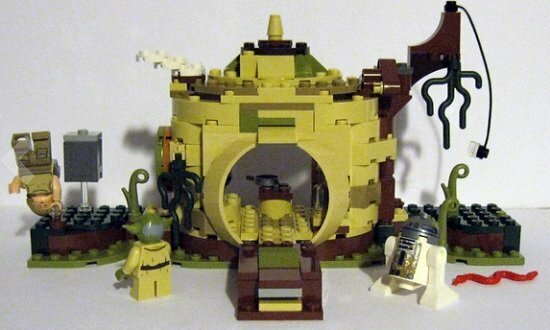 This set has 3 classic LEGO Star Wars figurines in Luke, R2-D2, and of course Master Yoda. It’s time to take to the swamp and do some handstands. I’ll admit it: Darth Vader is one of the coolest bad guys ever. There is just something about his black suit and mechanical voice that strike fear across the galaxy. This set is based on Star Wars Episode III, Revenge of the Sith. This set definitely has a dark side to it, and you can make Anakin’s dark side appear by twisting a mechanism and turning Anakin into his evil counterpart, Darth Vader. The 5 figurines and set are interesting to play with, but maybe not as fun as some of the other Star Wars sets on the list. If you like the Dark Side, this may be the set for you. General Grievous is truly intimidating in this great looking budget LEGO set. This set is based on the Star Wars: Clone Wars TV series. It includes Mace Windu and is easy to set up great lightsaber battles. My favorite part of this set is definitely the Combat Speeder. It has great colors and even includes a spring-loaded missile to fire at Mace Windu. With over 150 pieces and a low price, this set is a lot of fun. LEGO Technic sets are some of my favorite LEGO sets because they include not only great LEGO options, but they also include great mechanisms, motors, gears, and electrical components. These options add another dimension to your child’s LEGO play. 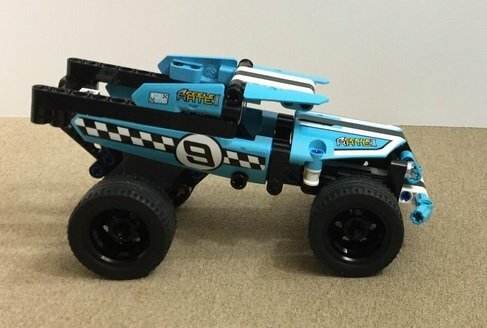 If you are looking for a great looking LEGO set that is not only affordable but looks great, then this stunt vehicle set is a great choice. This set looks great with its black and white racing stripe. It also has cartoon eyes and some great looking tires. Pull this set back and let it go. Not only does this set build well, but it also functions as a ramp jumping truck. A ramp is included. This great looking Technic set is not only a good value at about $15, but it is exceptionally versatile. 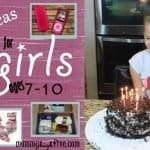 Your tween boy or girl will love putting this set together. This set can not only be built into an ultralight helicopter, but it can also be built into an experimental aircraft. Just like other technic sets, this set features a great looking main cabin, tail rotor, and gear wheels. This set is highly recommended. 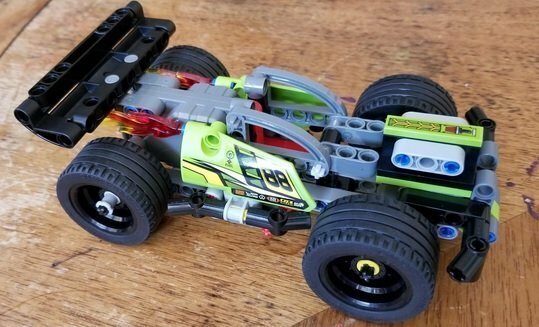 At under $40, this budget technic set is a great value. My 8-year-old absolutely loves this set. It is not only a fun build, but also is a lot of fun to play with after it is assembled. The motor pops out when the race car runs into the wall. Like many of these Technic car sets, this set also has a pull back mechanism that springs and releases once charged. This set can also be combined with the WHACK set to form a great combined car. I would definitely recommend this set. The car also has some great details including spoiler, wide rims, and great looking tires. This set makes a great compliment to the BASH set above. Our 8 and 9-year-old kids love to race WHACK and BASH and see who can reach the wall the fastest. Whack can be combined with Bash to make a fun combo vehicle. This set is easy enough to put together but challenging enough to keep kids interested. This set has some great racing features include a rear spoiler, motor block, and great looking tires. I’d recommend buying WHACK and BASH together if you have a kid around 7-11. Boys and girls alike will like this set. As a parent, I enjoy the way this set makes kids think. This great looking construction equipment can be built not only as a compact dozer, but also as an articulated truck. 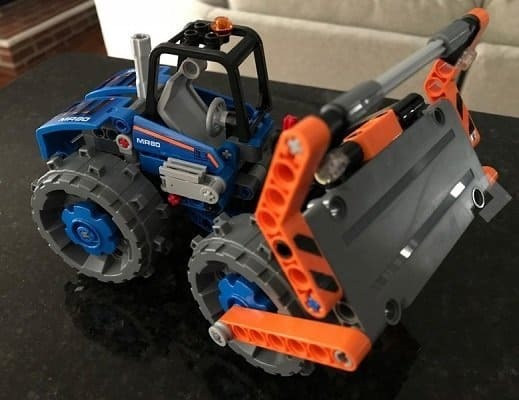 The Technic Dozer set would be perfect for boys or girls who like construction. It has some great looking construction details including working bulldozer steering and blade. This set is fun to build and has some fun mechanisms to work with. LEGO City Sets are a great chance to celebrate some of life’s real life heroes. These sets have some fantastic vehicles and awesome mini-figures. All of these LEGO City Sets are inexpensive. This is a really amazing set for the price. It comes with 3 different vehicle builds. 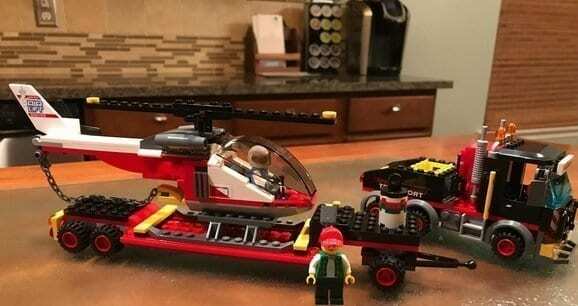 The helicopter build is my favorite of the three and is built out of red and white blocks with a great cockpit for the pilot. The truck is also well put together with a lot of details. This LEGO city set comes with 2 mini-figures and is my favorite in this category. The flatbed truck can be hooked up to the truck, and the helicopter can be mounted to the flatbed to haul the helicopter around. Pizza, pizza, get your pizza here! With this LEGO set, you can almost smell the hot pizza waiting in the window. 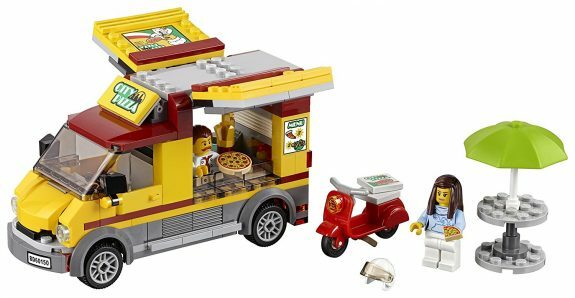 This value LEGO City set allows you to construct your own Pizza Food Truck. 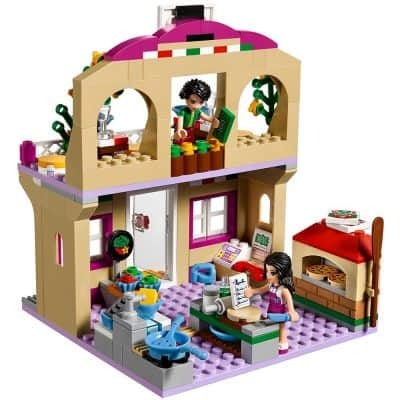 It comes with a chef and girl customer mini-figure and is loaded with red, yellow, and green Italian character. The set has two vehicles, a Pizza food truck and a small delivery scooter to allow for great pretend pizza business play time. 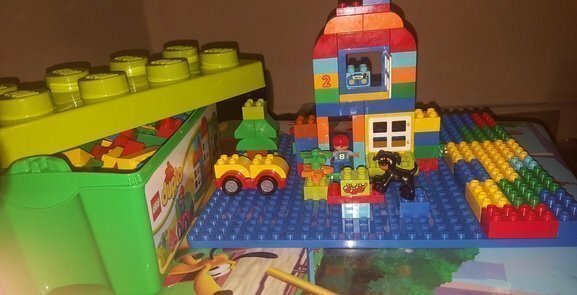 Any girl or boy younger LEGO fan would love this inexpensive LEGO build. Who doesn’t love taking a drive up the mountain in an ATV? This set focuses on the fun of an ATV vehicle and all the equipment that it takes to make that great mountain or race ride happen. 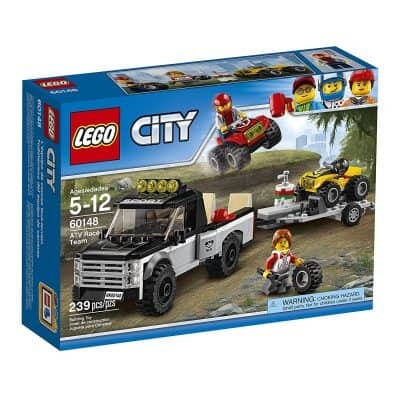 This LEGO City set includes a black and white sport truck, a trailer, a red ATV, and a yellow ATV. It also includes a girl and a boy mini-figure to create some great at-home ATV races. This set is great fun for a young boy or girl. 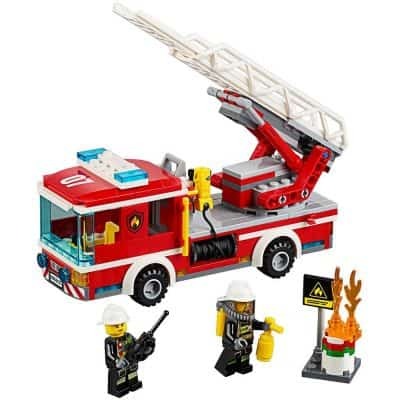 Kids can build a great looking fire truck with this value LEGO City set. It has two firefighter mini-figures so that the fire emergency can be averted. The firetruck has some great details including a firehose, blue lights, and a large boom arm that can be raised and lowered. If your kids love fire engines, this is a good LEGO option. Who doesn’t like time outdoors camping? 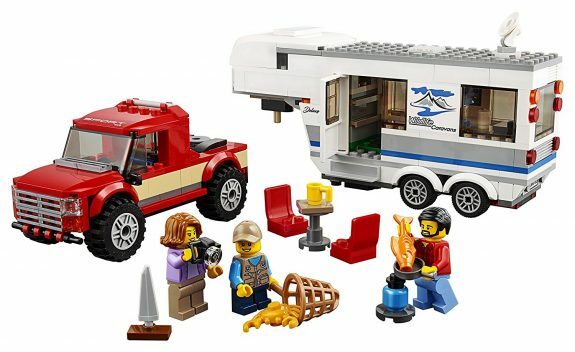 This budget LEGO City set brings camping to life with 2 great vehicles. The first vehicle is a great red sport truck perfect for offroading in the mountains. The second vehicle is a caravan trailer that would make for some great family time. This set also includes 3 mini-figures and some fishing gear. It would be fun for boys or girls. 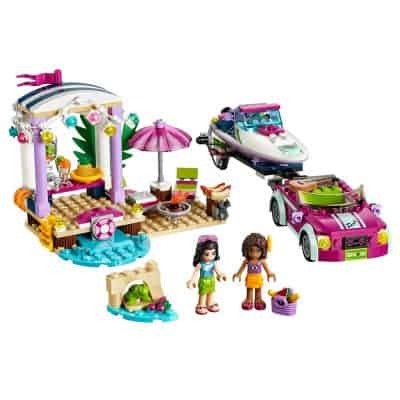 LEGO Friends Sets are specifically designed with the young lady LEGO builder in mind, though they can be enjoyed by boys as well. Featuring fun colors and themes, these sets are perfect for a birthday or Christmas gift. Every kid dreams of having a treehouse, and LEGO lets you build one. Mia’s Treehouse comes with everything you would dream of having in a real treehouse–a balcony, zip wire, ladder, climbing net, and even an attic with an opening roof. 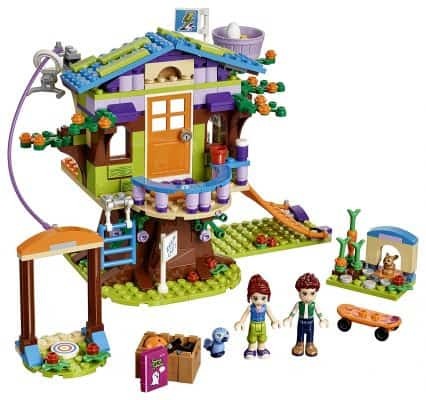 This set also includes two mini-figures, a bunny with its own house, and a pet bird. It’s pizza time! Get baking some pizza in the Heartlake Pizzeria. This LEGO set has amazing details. 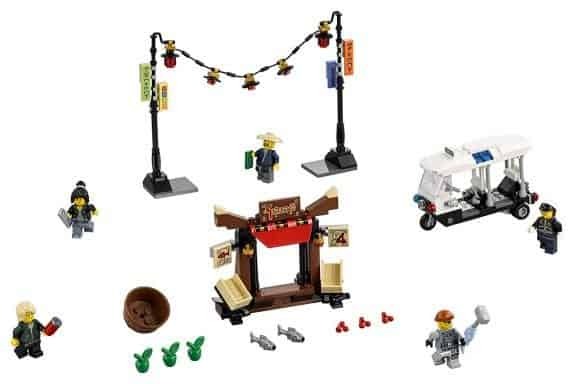 From the pizza oven to the cash register and tiny pizza boxes, this set is awesome! Not only will kids enjoy building the pizzeria, but they will also love placing an order, making the pizza, and then delivering it on the delivery scooter. Mini-figures Emma and Oliver are included. What kid wouldn’t love pretending to have a beach party? LEGO’s Andrea’s Speedboat Transporter set comes with everything to make a great beach celebration. Mini-figures Andrea and Emma drive their beach car (hauling their speedboat, of course). Then they party under the cabana at the beach juice bar! Once again, LEGO pulls out all the stops to make a small set so much fun! If you are looking for a surfing or kayaking adventure, Mia can help you at the Heartlake Surf Shop. 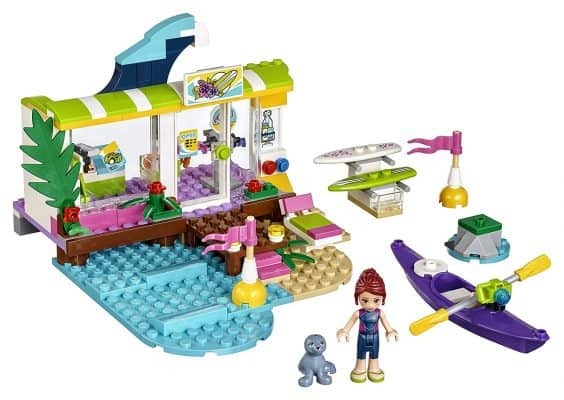 This darling LEGO set features everything for a great water experience–surfboards, a kayak with a paddle, binoculars, sunglasses, water bottles, and even a postcard. The shop doors open, and there is a cash register for Mia to ring up customers! After building the LEGO Friends Snow Resort Ice Rink, enjoy mini-figures Stephanie and Nate hitting the ice. 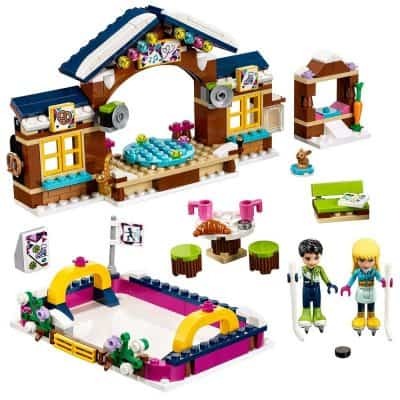 This set includes a skating lodge with a revolving stage area. It also has a skate rental booth and a pretzel shop. After a refreshing skate or game of hockey, Stephanie and Nate can sit down and enjoy a cup of hot chocolate and a pretzel while watching a performance on the stage. These LEGO Superhero Sets feature some of the most popular Superheroes out there. They combine great value with favorite superhero mini-figures and super vehicles. Tony Stark has maybe gone too far with this LEGO superheroes set–an Ironman big and strong enough to fight with the mighty Hulk. 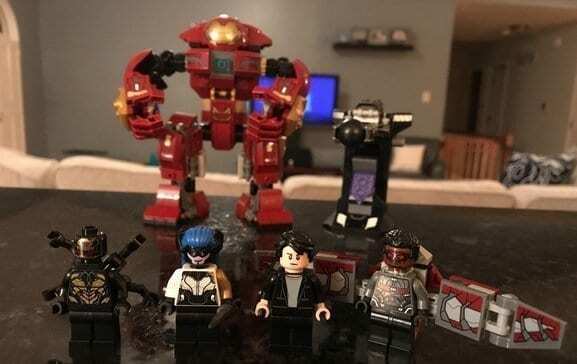 This set has 4 great looking Infinitiy War mini-figures including Falcon, Proxima Midnight, Bruce Banner, and an Outrider figure. Falcon has some great expanding wings. The key to this budget superhero set is the mini-figures. They make it fun to recreate some great battles in Wakanda. The Hulkbuster is fun, but overall this is just an average set at a good price. 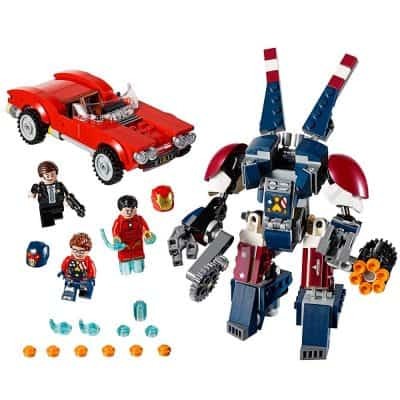 This Marvel superhero set has not only Marvel Agent Olsen and his red sportscar, Lola, but it also has invicible Ironman. Tony Starks’ nemesis Justin Hammer is included in this fun set, with Detroit Steel to give Marvel fits. Detroit Steel makes a great counter to the Hulkbuster set up above. This set is a great value and good superhero fun. This really small set is the smallest of the budget superhero sets on the list. The best part is the great mini-figures that capture the battle between Superman and Batman. The bat signal and roof top bunker is set up to help Batman defeat Superman. Will it be enough? Batman and Superman can fight it out and decide the outcome in this superhero LEGO set. Soldiers of Wakunda unite! This set has the biggest Marvel superheroes vehicle of any of the sets reviewed. It is truly a great value. Build Marvel Black Panther’s Royal Talon Fighter, which has tons of great Wakunda features and style. This set includes 3 mini-figures and great Wakunda weapons. This is an excellent choice for any superhero fan. What could be more fun than a LEGO Avengers Superhero adventure with Thor, Rocket, and Groot? This set is a great collection of theme and LEGO fun. With the escape pod, you can recreate some great action adventure from Marvel the Avengers: Infinity War. 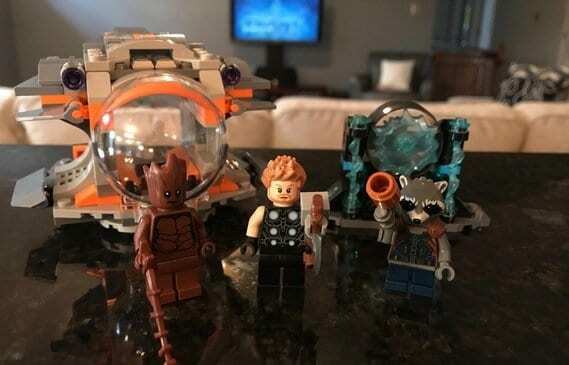 This set is definitely recommended for any fans of Guardians of the Galaxy. These LEGO Minecraft Sets are all under $40. We’ve picked our favorites that capture the excitement of LEGOs combined with the play of Minecraft. This LEGO Minecraft set is perfect for the Minecraft fan in your life. With this set, you can build a Minecraft style chicken farm with a chicken coop that looks just like a chicken. 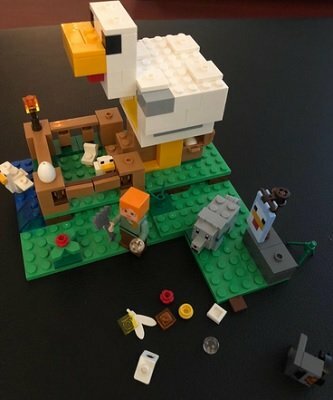 This set includes an Alex Minecraft mini-figure as well as chickens, a baby chicken, a tamed wolf, and chicken eggs. This block style design is not for every kid, but if your child loves LEGOs and Minecraft, this is a good set for the money. Why not get your child off of Minecraft video games and onto creative and STEM play with this Minecraft Zombie cave build? 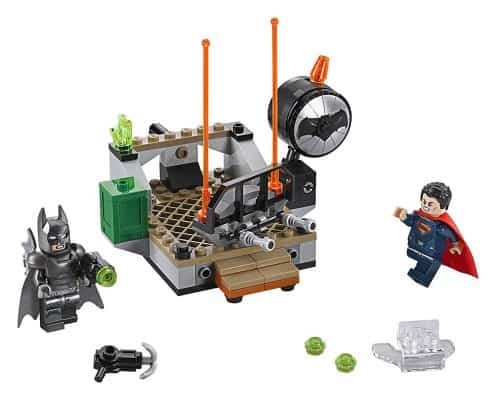 This set features a Steve Minecraft mini-figure, a zombie mini-figure, a baby zombie, and a bat. 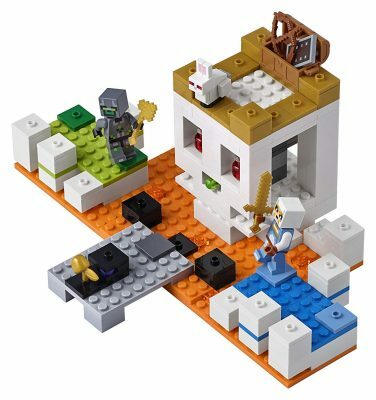 This budget Minecraft LEGO set will let your child’s imagination flow. It is complete with Minecraft style ore including coal, redstone, gold, and diamond ore. This set has a lot of pieces and details and is one of the most popular Minecraft LEGO sets. 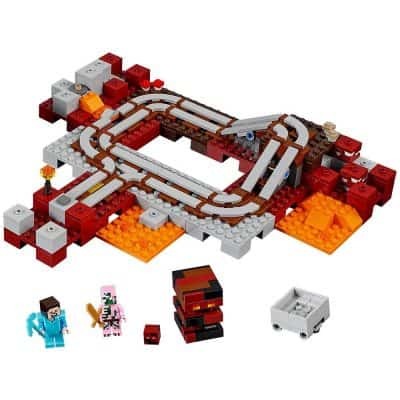 This Minecraft Nether Railway set is incredibly creative and is my most recommended of all of the budget Minecraft LEGO sets. Your child can build a Minecart rail track and allow the magma cube to hop along the track. It also features two great looking Minecraft mini-figures, including Steve and a Zombie Pigman. This set can be built in three different alternative builds outlined by the instructions. If your children like Minecraft, this is a great choice for them. This Skull Arena is fun to build and then play with. Minecraft fans will enjoy facing off against an opponent in this area, with the winner claiming the treasure of a golden apple. This set includes 2 mini-figures, a slime shooter, and a killer rabbit. Like the other sets on this list, this one can be combined with any other LEGO sets or bricks to expand it. 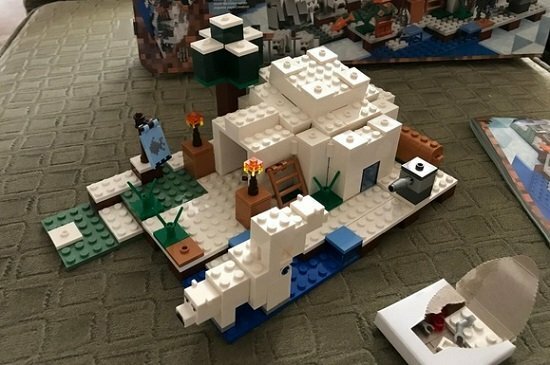 Minecraft players love this “cool” LEGO set, which is a snowy polar landscape. The Polar Igloo has ice blocks, plants, and an arrow dispenser. Also included are an Alex Minecraft mini-figure, a polar bear, and a baby polar bear. This set would be a great one to combine with one of the other Minecraft LEGO sets on this list. These LEGO NINJAGO sets are perfect for the child that loves the Ninjago TV shows. 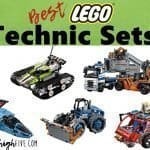 These sets all have great ninja costumes and feature exciting NINJAGO scenes. This NINJAGO LEGO set is part LEGO, part mini-figure, and part baseball cards. This package includes a Cole mini-figure, 4 battle cards, and LEGO bricks to mount the figurine. My 8-year-old likes the excitement of opening this package. Don’t buy this as a LEGO set, but do buy it if you want a fun figurine and cards for your child to open that won’t break the bank. Just like all NINJAGO sets, this set features some great mini-figures dressed in Ninja attire. It is a relatively small set that can be built very quickly. 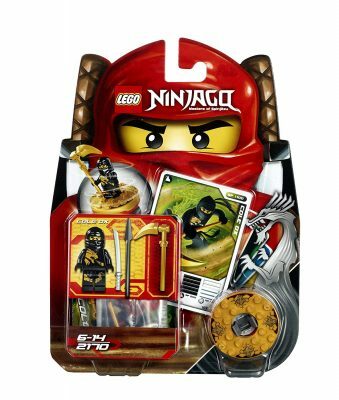 For the cost, this set has 3 really nice looking mini-figures including LEGO Ninjago Kai with a katana blade and a great looking red ninja costume. Slackjaw has a red vermillion axe and Rivett has a good vermillion sword. Rivett and Slackjaw wear great looking armor and helmets as well. The shiny egg explodes open and the snakes can be released. Great fun for any Ninjago fan. This fun NINJAGO set comes with 5 great looking mini-figures and some great looking movie sets to set up an epic LEGO Ninjago battle. Lloyd Garmadon, the Green Ninja himself, and Nya are ready for action. This set includes a police tuc-tuc, which allows for a driver and a passenger. It is a simple but fun car. There is also a street food stand and some great looking NINJAGO laterns. The rest of the mini-figures are Officer Torque, Shark Army Thug, and Ham. At about $25, this is a great budget set if you are looking for a LEGO Ninjago set with fun vehicles. This set is a motorbike take on jousting where the two combatants use swords instead of joust. Two drive at each other and use their long swords to knock the other one off. This set includes two really great looking mini-figures; Zane and Mr. E. both have costumes to match their great looking motorbikes. 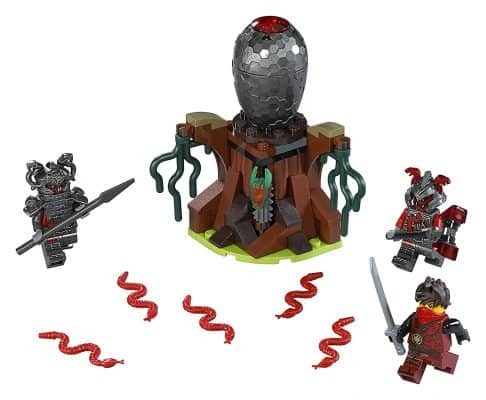 This is definitely one of my favorites of the NINJAGO budget sets. Don’t forget the detachable drone that comes off Zane’s bike. With this great looking LEGO NINJAGO set, your child can be off to the races in water or by land to go fight against the evil Lord Garmadon. 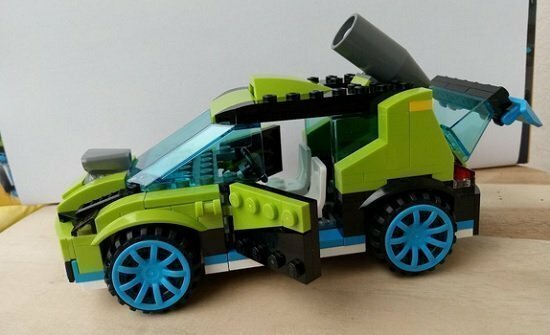 It contains the best looking vehicle in our recommended NINJAGO sets. 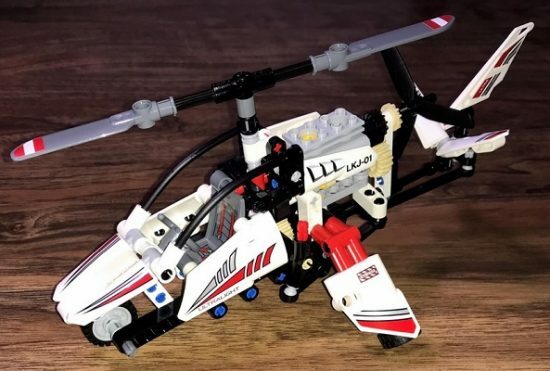 Kai’s Katana V11 has a lot of great features and LEGO NINJAGO details. Some of these features include foldout boosters and spring-loaded weapons. This set contains LEGO mini-figures Kai and Luke Cunningham. LEGO Junior Sets are good for a younger child who is tired of playing with LEGO DUPLOs. These sets are not quite as complicated as the later sets, but are much more functional than LEGO DUPLOs. This LEGO Junior set is small in piece count but large in play value. 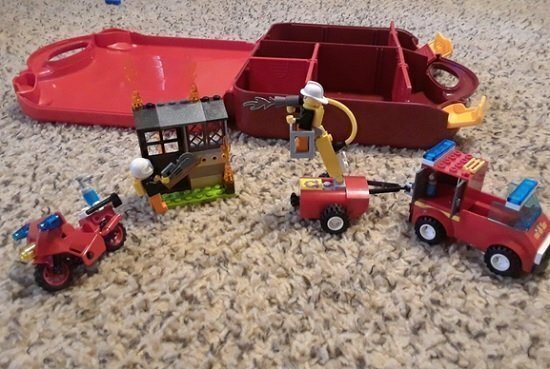 With this set, your child can bring the firetruck and motorcycle to the fire and put it out. This set features a great mini firetruck and a red motorcycle. 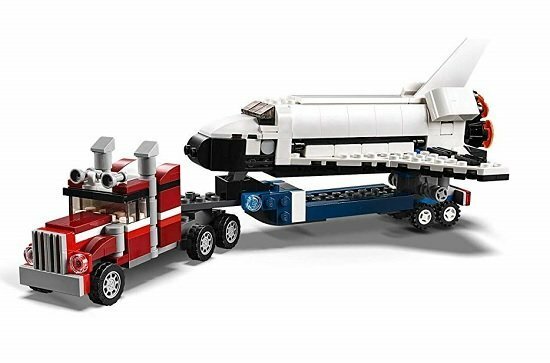 If your kid is not quite ready for big kid LEGO sets, then this is a great set. It also includes a male and a female firefighter that would for great fun for your boy or girl. The carrying case is durable and perfect for storing this LEGO set. This LEGO set offers a fun adventure! Be the police officer or the bank robber in this attempted bank heist. The getaway vehicle is a quad bike, and the cop has a helicopter. The police station even has a jail cell with a door that opens and an opening safe. The set includes two mini-figures, money, and everything seen above. Your child will love this LEGO set! Any kid who likes Disney Pixar Cars will love this LEGO set. With Lightning McQueen, Smokey, and Junior Moon cars from the movies, this is a popular set. The auto garage includes a car ramp, tools, a tool cabinet, a movable crane, and 3 spare tires. Kids love both building the set as well as playing with it once it is built. 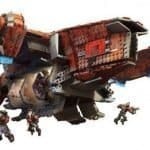 The build on this one is more simple than most of the others on this list. This is one of my favorite LEGO sets on this list. It has so many fantastic features. 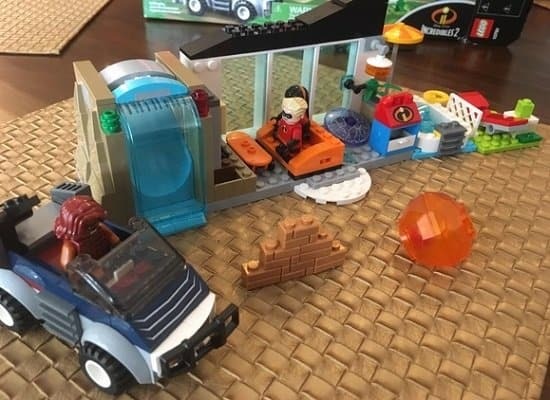 Just like in the movie “Incredibles 2″, the house in this set has a moving fireplace, indoor waterfall with a door, a chair with a catapult, and a tricked out car. Four mini-figures are included–Violet, Dash, Brick, and baby Jack-Jack. You can even fire Jack-Jack’s fireball at Brick’s getaway car. 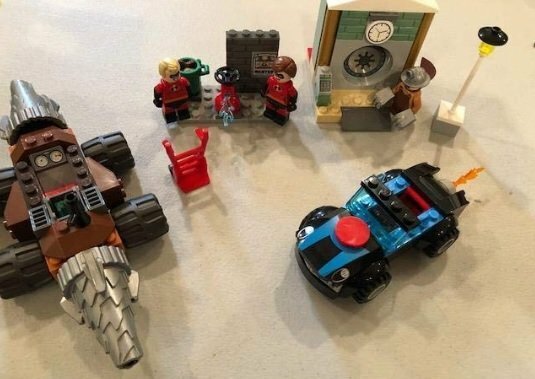 Here is another awesome “Incredibles 2″ LEGO set. This one includes mini-figures of Mr. Incredible, Mrs. Incredible, and Underminer. The bank vault has a breakaway door, and the Tunneler machine even has spinning drill bits! It can break open the vault door to break into the bank. Also included is an Incredible vehicle. This is a toy which will entertain kids for the long haul! These LEGO DUPLO sets are perfect for your young child who isn’t quite ready for the small normal LEGOs. DUPLO blocks are designed with kids under 4 in mind and help young children explore their imagination. There is nothing cuter than a toddler or preschooler playing with LEGO DUPLOs. This blocks in this LEGO DUPLO train are the perfect size for small hands. Your child will enjoy building this train (probably with a little help at first) over and over again. I love that this train helps children start learning numbers and counting concepts. It also comes with two child DUPLO figures and a cat figure. 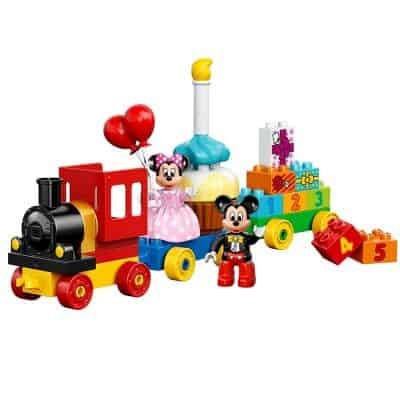 Mickey Mouse, Minnie Mouse, blocks, and a birthday train–what could be better? This cute LEGO DUPLO set is perfect for toddlers and preschoolers. Kids can build the train and also the birthday cake. Three of the blocks are decorated to be birthday gifts. This set is great to play with, and the pieces also make a fun birthday cake topper for your little one. If you are looking for an exciting and fun LEGO DUPLO set, this could be the one! This set includes a dump truck that actually dumps and an excavator with moving tracks and a rotating cabin. Your little one will enjoy putting bricks in and dumping them again and again. 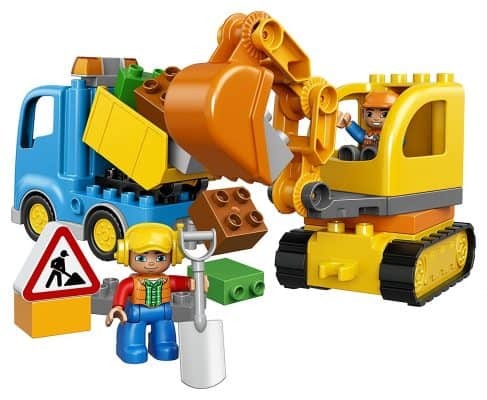 Also included are two LEGO DUPLO construction worker figures, a roadwork sign, and a shovel. 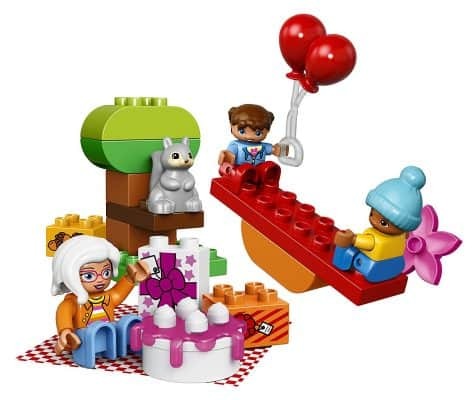 Birthdays are a favorite occasion for every child, and the LEGO DUPLO My Town Birthday Party set brings the magic of birthdays to life every day. Your toddler or preschooler will enjoy this outdoor birthday party scene. Pretend to open gifts and eat cake at the park. Play on the seesaw and spend some fun time with friends and grandma. Included are two children figures, a grandma figure, and a squirrel figure. It’s no wonder LEGOs are such a popular toy among children of many ages. They are not only fun to play with, but they also provide some great benefits to kids. First, LEGOs are a STEM toy, which means they help kids hone their building/engineering and math skills. LEGOs give kids the chance to build something from individual parts, which helps with problem-solving, critical thinking, and ingenuity. When building specific sets, kids follow the included instructions, which is helpful in teaching kids to follow directions carefully. It also helps them learn to break larger projects down into smaller steps, and then put those steps together for a finished project. Kids learn more about shapes and combing two shapes to create a new shape. Whether using written instructions, pictures, or creatively playing with LEGOs, kids have to use planning strategies. LEGOs also encourage creativity. There are hundreds of sets that come with specific instructions, but kids can also use their own imaginations and creativity to build creations of their own. LEGOs give kids great practice in improving fine motor skills. Manipulating pieces, placing them, and pushing them down improves fine motor and eye-hand coordination, especially among young children. LEGO DUPLOs are an excellent choice for children who are 1-year-old to 4-years-old. Because DUPLOs are larger than regular LEGOs, DUPLOs are easier for small hands to manipulate and be successful using. Even regular size LEGOs are good for fine motor development among children. Whether 5-years-old or 12-years-old, LEGOs help with fine motor control and hand-eye coordination. Kids can improve their social skills by playing with LEGOs. It is fun to play LEGOs with someone else, and especially when building a LEGO set together, kids have to communicate and interact. In an age when kids have trouble communicating unless it’s through a screen, LEGOs provide face-to-face social interaction. Many LEGO sets come with mini-figures, which encourage kids to use their imaginations and interact as they do so.